JP: "The first picture is of a male crested toad that was taken in the area known as “Punta Ventana” in Guayanilla. The second photo shows a pair of toads (the male is smaller) in a reproductive event. This photo was taken at the Guanica Dry Forest, in the Tamarindo area. The males competebetween each other to be the first to make the amplexus (reproductive embrace) with the female toad. In the photo, we also see black mangrove roots which are used by the female to entangle the row of eggs while the male fertilizes them. " Greetchen: "Where can we see the crested toad?" JP: "Today natural populations are known fromthe Guanica Dry Forest in “Punta Ventana” in Guayanilla, and a small wetland in Yauco. These areas have natural temporary ponds where toads reproduce. " 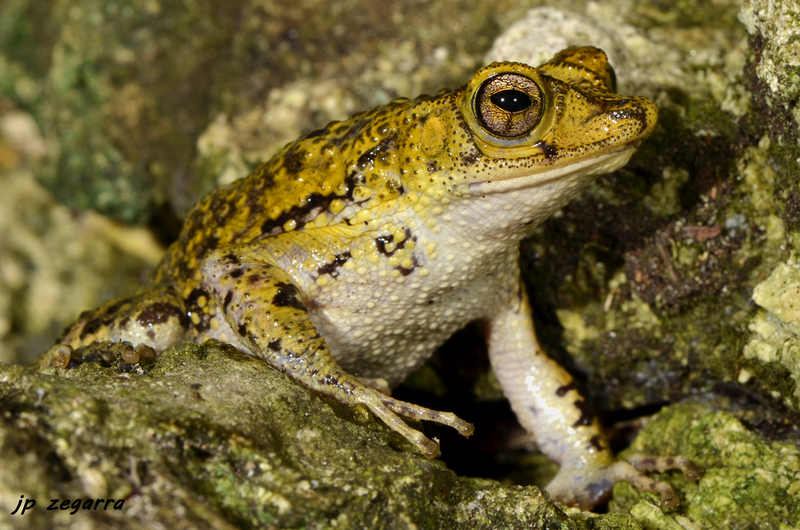 JP: "Historically the toad was found in other towns of Puerto Rico like Coamo and Quebradillas, and other karst areas, but it is believed that toads were extirpated from these areas by deforestation and habitat destruction. The species is listed as threatened by the state and federal government. Currently, the status of the species is thought to be improving because of reintroduction efforts, but much remains to be done. " JP: "I started learning about the crested toad when I was helping a friend on his master's thesis. Then as a student, I joined a working group for the species, led by the Puerto RicoDepartment of Natural and Environmental Resources and the U.S. Fish and Wildlife Service (USFWS). Currently, at the USFWS I helpimplement recovery efforts for the species. "